WAYNE, N.J.—June 12, 2017—Haier Ductless is launching a new ductless series designed for light commercial installation as well as large residential applications. The FlexFit Pro series offers a number of options to make installation and inventory easy. 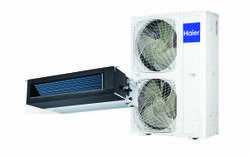 Haier Ductless is launching a new ductless series designed for light commercial installation as well as large residential applications. The FlexFit Pro series offers a number of options to make installation and inventory easy. Consistent airflow in wide range of ESP up to 0.6in. Haier is one of the leading producers of HVAC products with capacity to produce 20 million units per year and with 10 percent of global market share. With a global R&D center, Haier is known for world-class quality and design, built and manufactured by Haier. Haier air-quality products offer the technology, features and benefits that your projects demand—delivering energy savings, simplifying installation processes and fitting seamlessly into a wide variety of residential and commercial spaces. For more information, please visit www.haierductless.com or connect at http://www.facebook.com/Haierductlessair and Twitter @haierductless. GE Appliances, a Haier company, makes moments that matter for our owners through our passion for making great appliances and providing unparalleled services. Owners have more choices than ever before under the Hotpoint, GE®, Haier, GE Café™, GE Profile™ and Monogram® brands. Our products include refrigerators, freezers, cooking products, dishwashers, washers, dryers, air conditioners and water filtration systems. For more information visit www.geappliances.com/our-company. “HOME FREE” and Haier Team Up for Season Two!